Censorship. A simple definition might be "the examination of material (such as books, movies, news, and art) and official suppression of any parts that are considered obscene, politically unacceptable, or a threat to security (adapted from my computer's dictionary). 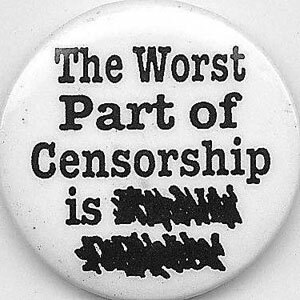 It is closely related to censure, which means harsh criticism or to criticize harshly. But lately, censorship seems to have gone wonky in other ways, too ... some consternating and some downright dangerous. Within the last three days, I have experienced censorship in conversation with three different friends. First, I was telling a friend about a disturbing incident that I'd read about in the paper. "Does this have a sad ending? If so, I don't need to hear it." The story was a cautionary tale about her field of work, but it did, indeed, have a sad ending. So with that, I was shut down. And I felt shut down — censored. But mostly I felt sad that there are people who won't (can't?) allow themselves to feel the sadness of others. Have some of us become so fragile that there's no strength and no room left for empathy? How are we going to face the extreme sorrow of the climate change emergency if we can't even share a story about a sad incident in a next-door city? I don't just tell stories willy-nilly. There's a point to a story that I choose to share — sometimes it has a connection to the other person, but sometimes it's simply something that I found interesting or edifying. In the second incident, I recounted a short TV show that I'd watched on Netflix and found instructive for my own career. I'll admit that my menopausal brain might have made the story more meandering than it needed to be. But my friend, instead of engaging with the story, said (I'm paraphrasing), "You know how people who watch TV will talk about shows they've watched and bore you to tears? You just did that." Ouch. Obviously her mother never instructed her to say nothing if she didn't have anything nice to say — that was my first thought. But then I began to mourn the lack of patience our society has developed. Can't we just talk about "stuff" with friends anymore? If we don't have the time and patience for everyday — uncensored — conversations, how will we ever have the time and patience to listen to how serious the climate crisis is, the science behind it, and the solutions we needed to implement yesterday? Positive thinking does not stop evil and greed. It just doesn't. It doesn't get the good people elected. It certainly hasn't mitigated climate disruption. Talking about how Big Money and Big Oil are killing the future, what their strategies are, and how we can beat them — that's how we will, well, beat them. Not by pretending that everything is goodness and light. If we're going to fill our lives with censorship, I'd like to suggest some Censorship for the Planet. Let's stop giving column inches in our newspapers and blogs to climate change deniers. Let's stop watching news and other shows that give air time to climate change deniers. Let's stop "sharing" the dangerously misleading drivel and "alternative facts" of climate change deniers on our social media channels. Folks, let's stop censoring ourselves, our friends and our loved ones (and our climate scientists) and start really listening to them. If we're going to censor at all, let's censor (and censure) those who are committing the greatest evil and the greatest ever crime against humanity: climate change deniers who have delayed urgent action on this emergency for decades, causing millions to lose their lives or their livelihoods, their food security and water sources, their homes or entire homelands. Let's be very clear that freedom of speech and expression should not, does not, cannot include the freedom to commit progenycide.